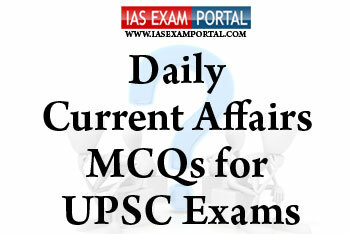 Current Affairs MCQ for UPSC Exams - 18 JANUARY 2019 | IAS EXAM PORTAL - India's Largest Community for UPSC Exam Aspirants. 1) Under the scheme, Government is paying full employers’ contribution of 12% (towards Employees’ Provident Fund and Employees’ Pension Scheme both), for a period of 3 years in respect of new employees who have been registered with the EPFO. 2) A direct benefit is that these workers have access to social security benefit through Provident Fund, Pension and Death Linked Insurance and a large number of people will find jobs in those establishments registered with the EPFO. 3) The entire scheme is onine and AADHAr based with no human interference in its implementation. Q3). Which of the following statements with respect to UNISPACE (United Nations Conference on the Exploration and Peaceful Uses of Outer Space ) are correct ? 1) UNISPACE Conferences provided a platform for a global dialogue on key issues related to space exploration and exploitation that have yielded tremendous scientific as well as economic and societal benefits for humankind. 2) UNNATI, a capacity building programme on Nanosatellite development, is an initiative by ISRO to commemorate the 50th anniversary of the first United Nations conference on the exploration and peaceful uses of outer space (UNISPACE-50). 3) All thre conferences of UNISPACE were held in Geneva,Switzerland. collective action supported by the government and other research agencies. 2) Each FPO has to register themselves under the companies act 2013,at the state,central or village level. 3) Small Farmers' Agri-Business Consortium (SFAC) is providing the overall support to the FPO’s including oversee of procurement under Minimum Support Price. Q5. The Advocate General of a state is appointed by which of the following personalities/ offices ?